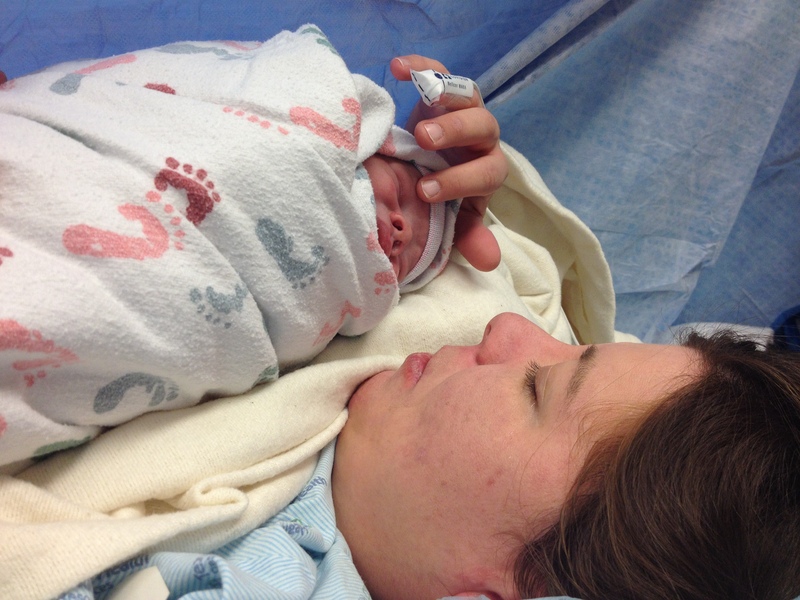 This is part two of at least three in the story of my third child’s birth. You can read about the first part here. Before I continue I need to make it clear that I do understand that many women would willingly undergo surgery if they could just have the opportunity to birth their very own child. I have never experienced the very difficult pain of infertility and do not wish to heap coals on the heads of those who have or are currently experiencing this pain. This story may seem like a “mole hill” to some but for me it was and is a pretty difficult experience that I need to process and writing is my way to find that healing. We scheduled the c-section for January 7th. (I was tempted to go for Thursday since my first two children were born on Thursdays but since Devin’s birth was so different already we decided that we would keep it unique in every way). We arrived at the hospital at 5:30am for a 7:30am procedure. It was then that I met my first angel. A woman named Mary had been assigned as my pre-op nurse. She was so kind and although I was so nervous and quite honestly scared at what was to come, her kindness helped settle my uneasiness. After checking vitals, I changed into that lovely hospital gown and took one last potty break. IV’s were inserted, questions were answered, papers were signed. This was followed by an entourage of people entering the room to discuss everything from the details of the epidural to payment plans for the birth. And then…a familiar face…just before my procedure I was greeted by my wonderful doctor who had ordered one last ultrasound hoping with me that our sweet Devin had changed his position making a vaginal delivery possible. As she ran the doppler across my pregnant belly, we received the confirmation I already knew in my heart that Devin had not cooperated as I had hoped. The c-section was inevitable. I took a deep breath, acknowledged my fate and said goodbye to my doctor who left to prepare for my surgery. A few minutes later, a nurse brought in a set of scrubs for my husband to wear. And then they were wheeling me down the hall to the operation room. With each turn of the bed wheels, I could feel my heart beating faster and the tears I had been stifling began to stream down my face in slow, heated trickles. With each tear, my angel Mary was there to wipe them away. The doors to the operating room opened and I found myself in a large room. I know there was a lot of equipment in the room but I don’t remember anything about it. They helped me onto the procedure table and I was given my first ever epidural. Actually it was a combination epidural/spinal block…I think that’s the right terminology but regardless of the name/chemical makeup it did the trick. It numbed my body from the top of my abdomen down to my toes. At some point during this part I became extremely lightheaded and felt like I was having a panic attack. Thankfully, I had received a phone call the day before from an anesthesiologist who talked me through what to expect and had told me: “Don’t be a hero. If something feels wrong, speak up. We can fix it.” Thank God, in that moment, I was able to articulate what I was feeling. From what I could tell (based on my memory of the conversation buzzing around my head) my blood pressure had significantly dropped and I was really dehydrated. They quickly made adjustments and offered me oxygen. Although it felt like an eternity, within moments I felt significantly better and it was time to have a baby. They checked my body to make sure that I was completely numb and then my dr began the procedure by making an incision in my lower abdomen. Marshall was by my side, holding my hand and braving it right along with me. We waited. 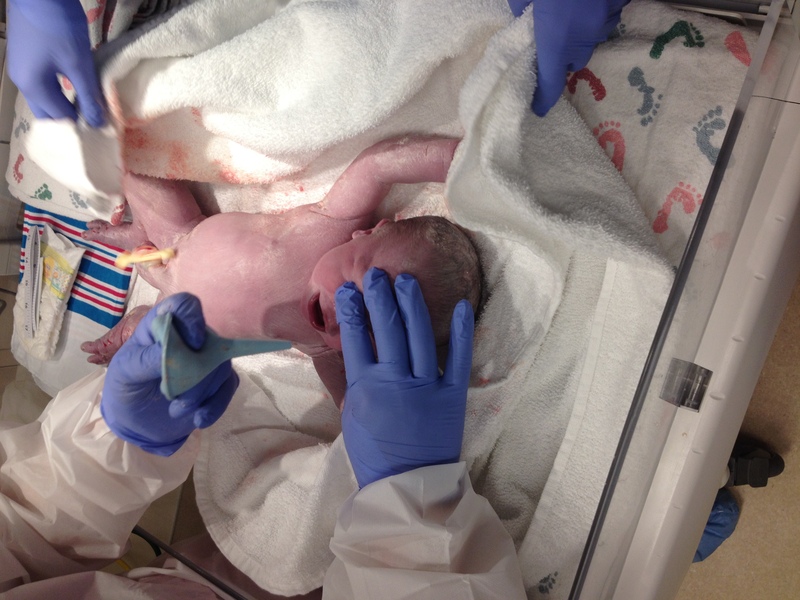 Then, at 8:01 am, after some pulling and tugging and suctioning of fluids, Devin was here! They took him to a warming bassinet and began cleaning him up and checking his vitals. My sweet darling husband wouldn’t leave my side until I insisted he go meet our son! A side note: even with two mostly natural births under our belt that included lack of sleep, coaching through hard and painful contractions, seeing lots of blood, the bravery my husband demonstrated that day standing by my side behind the blue curtain holding my hand was the greatest I’ve ever witnessed. And I fell more deeply in love with him in that moment when our eyes met and I saw in his face a determination to brave this with me his swollen, weepy and fearful bride. He honored and cherished me in a way that cemented our love for one another. After they cleaned up our bouncing baby boy, they swaddled him up and placed him on my chest. I was in love. Tears began trickling down my face again as I beheld this beautiful creation who just moments before was inside me. All 8lbs 1 0z and 20.25 inches of him! My doctor began the process of closing my incision and my husband took our sweet baby boy from me and left for the recovery room where I would go just moments later. The procedure was over. I would soon have the opportunity to bond with my baby. Little did I know that my adventure was not over yet. Trusting God in all of this had just begun but his faithfulness was just around the corner. Such a difficult thing to go through. I teared up reading it, especially about my brother standing by your side through it all. I can’t imagine. I love you all!